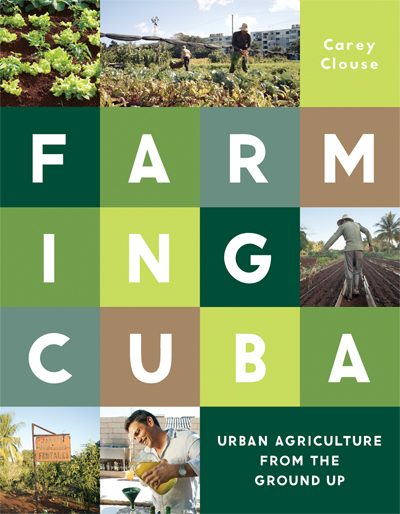 The following is an excerpt from Carey Clouse’s Farming Cuba: Urban Agriculture from the Ground Up, which explores Cuba’s impromptu agricultural development after the dissolution of the Soviet Union, and the challenges that development poses for modern day architects and urban planners. Following the collapse of the Soviet Union in the early 1990s, Cuba found itself solely responsible for feeding a nation that had grown dependent on imports and trade subsidies. With fuel, fertilizers, and pesticides disappearing overnight, citizens began growing their own organic produce anywhere they could find space, on rooftops, balconies, vacant lots, and even school playgrounds. By 1998 there were more than 8,000 urban farms in Havana producing nearly half of the country’s vegetables. What began as a grassroots initiative had, in less than a decade, grown into the largest sustainable agriculture initiative ever undertaken, making Cuba the world leader in urban farming. Featuring a wealth of rarely seen material and intimate portraits of the environment, Farming Cuba details the innovative design strategies and explores the social, political, and environmental factors that helped shape this pioneering urban farming program. While urban planning would ideally engage agricultural opportunities well in advance of food shortages, in the case of Cuba these efforts were applied across the city’s fabric as a response to real needs. From an urban design perspective, many of these agricultural interventions in Havana continue to remain disassociated from their physical context, lacking linkages that could be made with built elements, comprehensive signage, or other synergistic design responses. The formal implications of urban agriculture could be used constructively, perhaps even sustaining or branding within the larger urban planning work in Havana. This shift in thinking—from the strictly functional urban farm to the revered cultural landscape—would necessarily need to draw insight from both growers and designers. Planner and permaculture activist María Caridad Cruz acknowledges that this collaboration is a challenging yet essential undertaking, and that “inserting urban agriculture into the land management system is not a task to be worked out on a drawing board.” Instead, she writes, “it depends, to a great extent, on the interrelation among planners and doers, the community, and governments.” Indeed, Fidel Castro’s ability to seamlessly embed agriculture within Cuba’s political and social context has not given rise to an associated design cohesion, despite the potential to link farms to neighborhoods through physical and spatial planning. The communication breakdown between design and agricultural professionals in Cuba appears to be a missed opportunity. From the scale of individual farm components to the much larger systems that define growing spaces, design could serve to frame and contextualize the discussion around Havana’s agricultural infrastructure. Whether formally designed or not, growing spaces affect urban identity and have attendant shaping power, becoming part of the anatomy of the city. According to architect and educator Keller Easterling, some “of the most radical changes to the globalizing world are being written about not in the language of law and diplomacy, but rather in a spatial language of infrastructure. “Design thinking at this level also scales up to urban and regional planning, where infrastructural changes might begin to have profound impacts on the larger foodshed. Havana’s urban agriculture movement has been criticized as being a utilitarian and reactionary response to food scarcity rather than a proactive urban design initiative. Many of the state-sanctioned permanent farms in Havana occurred opportunistically in the decade following the food crisis, using land that was available rather than appropriate. Adriana Premat points to the informal space appropriation that growers employed in Havana, noting that “organopónicos have been built just because there was a nook here, a vacant lot there, even though they broke up the normal flow of city streets.” Landscapes that might otherwise have been slated for more conventional uses—parking lots, playgrounds, city parks, rooftops, and front yards—transitioned into a new agricultural terrain for food production. Because food access was such a dire and immediate need in Cuba, urban agriculture was prioritized over many other important uses, including environmental stewardship, housing development, and the formation of public recreation spaces. Urban agriculture initiatives have occasionally prevented the development or retention of valued civic amenities, such as parks. This collective tunnel vision has led to a divide between agricultural advocates and other types of developers, “pitt[ing] those involved in city planning and renovation against key decision makers in the Urban Agriculture Department and the armed forces, whose primary concern was food production rather than good urban design.” Despite the regular interweaving of agriculture with buildings and other types of spaces, there is still a perception by designers and planners that food production has unfairly taken precedence over housing and recreational spaces in urban areas. This interlacing is evident in most of Havana’s neighborhoods, with the exception of the historic Habana Vieja district, where development for tourism has all but eliminated the last two decades of urban agriculture efforts.